The significance of this particular workshop was the depth in which this trio demonstrated the aspects of music dealt with in the workshop. 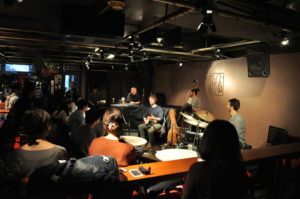 Daniel Freedman started with the specifics of the drum tuning then moved onto the stylistic feature of the music and groove, pulled an example of Ragae music, explained how closely its originated to the swing groove. Then the trio played the Ragae, really played, not just for the purpose of showing it as an example but really played. Then to answer the question from the participants regarding to the piano comping and the drum comping on the snare, Nir Felder, Tal Mashiach together with Daniel Freedman created a beautiful blues piece on the spot. This is the whole point of the workshop, not just receiving the verbal explanation of some aspects in music but witnessing those aspects being materialized in the improvised music format in real time! !